The Un-Official Blog of Romance Author Maddie James: Time to Vote! I'm late in getting this announcement out! If you are interested in voting on cupcakes this month, click here! 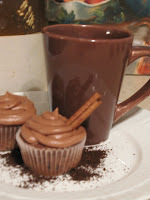 My mocha cupcakes have 8 votes! LOL But there are so many scrumptious-looking cupcakes so check them all out and pick your fave. If you want to go back and read the post and recipe, it's here. And, to see all of the entries in their infinite decadent glory, go here. Voting closes tomorrow, so hurry!